A Plastic Knife For Vegetables. Also Great For Baked Goods! Using a knife to cut salad can be far easier and quicker than trying to rip and tear at it with your hands. It's important to use the right kind though. Most people don't realize that the brown discoloration on their cut head of lettuce is actually caused by the metal knife used to slice it. A plastic blade eliminates this problem, and allows your salad greens to last much longer. Our Salad Knife is an affordable option that is ideal for cutting lettuce, tomatoes, baked goods and more. It's perfectly designed for cutting all of your soft leafy vegetables, or anything else using a sawing motion, and the high quality, serrated plastic blade. It,s not designed for harder veggies like carrots, but can be particularly handy for jobs like making sandwiches. You can spread your mayo, slice your tomato, lettuce or pepper and then cut the sandwich in half all with the same knife. It's also great for slicing anything cooked in a nonstick baking pan because it won't ruin the finish. Use this salad knife to cut brownies, cakes, lasagna and more. The large blade makes it easy, and allows you to serve it up with the same utensil. Stop tearing lettuce by hand, or using a metal knife that will cause browning. This lightweight tool features a long, angled blade with an evenly serrated cutting edge. Just place any greens on a cutting board, and the knife cuts quickly through them to the desired size. This method creates clean cuts on the leaves so they don't wilt or brown as quickly as they would if ripped or cut with a metal blade. The long handle has a curved, ergonomic shape that makes the tool easy to maneuver, and it stays comfortable during big jobs. The soft and wide, handle offers a comfortable grip for easy operation, and it can be used equally well by left or right handed people. It's long enough to keep hands nice and dry, and it easily chops through large heads of iceberg, or dense heads of cabbage. It even has a hole at the end to allow for hanging when not in use. Crafted from durable clear plastic with a soft green handle, this salad knife will last for years of usefulness. It would make a great addition to any kitchen, and can be especially handy for taking to parties or brunches. 12 inches long. Dishwasher safe. Order Yours Today! Blade Dimensions 7.5" x 2.2"
Uses cutting leafy greens, soft veggies and baked goods. 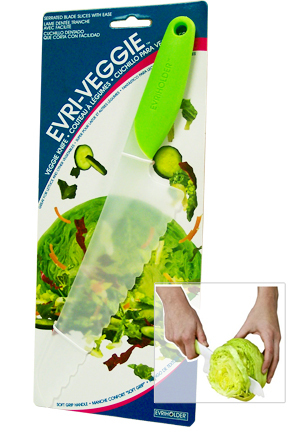 Evri-Veggie Salad Knife - Avoid brown and wilted lettuce. Use this plastic knife to cut salad and it will stay fresh longer. Also works great for things baked in non-stick cookware. Order Yours Today. Great buy and good product. This salad knife is great. It cuts well and does not make the lettuce brown. I bought a bunch of them so I could give them to my relatives in case they could not find them. Sharp And Stick-Proof. A Versatile Tool For Slicing, Dicing, Paring and Peeling. Sharp, Flexible And Ideal For Any Kitchen. From the Maker of Genuine Swiss Army Knives. Featuring A Super Sharp, 5" Blade That Is Coated For Performance.